Are you looking for something to do this year in the Rocket City? 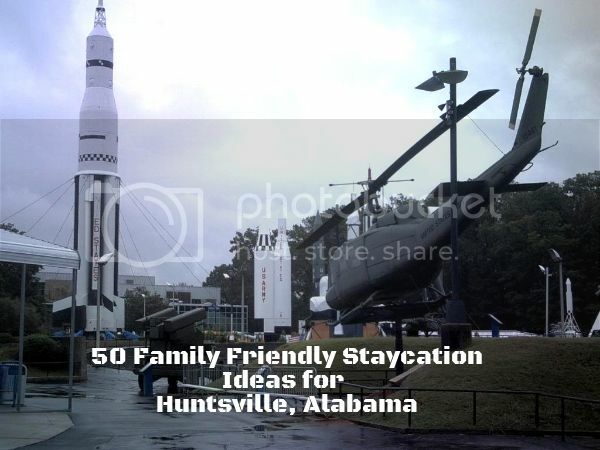 Here’s a list of 50 Family Friendly Staycation Ideas for Huntsville, Alabama. Find out what a rocket launch feels like at the US Space and Rocket Center to learn why Huntsville is called Rocket City USA. Hike the Stone Cuts Trail at Monte Sano State Park. Visit Lowe Mill Arts & Entertainment Complex and buy something unusual. Take the kids to nearby Madison to play at the Kid’s Kingdom. Feed the ducks at Big Spring Park. Tour historic Weeden House and learn about artist Howard Weeden. Visit Earlyworks Children’s Museum, the south’s largest hands-on history museum. Serve a meal to the homeless at Rose of Sharon or Downtown Rescue Mission. Learn how to tango, foxtrot or salsa (older kids welcome) at Rocket City Dance Club. Stroll through the exhibits at the Huntsville Museum of Art. Buy old fashioned candy at Harrison Brothers Hardware Store. Hit the trails on horseback at Star HB Farms. Feed a zebra at Harmony Safari Park. Learn how Alabama became a state at the Constitution Village. Walk through a covered bridge at Madison County Nature Trail. Treat your dog to a day at the dog park. Go ice skating at Benton H. Wilcoxon Ice Complex. Hike along the Devil’s Racetrack at Wade Mountain. Watch a movie in the park. Go on the Lucky Duck Scavenger Hunt (pick up clue cards at the Huntsville Visitors Center). Play in the children’s garden at the Huntsville Botanical Garden. Visit the buffalo soldier memorial. See the world’s largest pre-fabricated steeple at the First Baptist Church on Governor’s Drive. Play a round of glow-in-the-dark mini-golf at Madison Square Mall. Hike to the Natural Well, a never ending pit, at Monte Sano State Park. Visit Burritt on the Mountain for a summer concert. Go on the birding trail at Hays Nature Preserve. Play disc golf at Monte Sano State Park. Take a walking tour of downtown Huntsville. Visit the North Alabama Railroad Museum or the Huntsville Depot. Spend the day at Southern Adventures. Visit the grave of Miss Baker at the US Space and Rocket Center. Grab something yummy at the Chocolate Crocodile. Eat some BBQ from Dreamland. Stand in awe at the base of the Saturn V Rocket at the US Space and Rocket Center. Watch the Krispy Kreme donuts being made and eat one fresh off the line. Take a walking tour of the historical churches in Huntsville, Alabama. Watch a movie at Monaco Pictures. Visit the Veterans’ Memorial Museum. View the night sky at the Von Braun Observatory. Rent a stone cabin at Monte Sano State Park. Watch a Stars game at Joe Davis Stadium. Stroll through Maple Hill Cemetery. © 2013 – 2016, Tonya Prater. All rights reserved. I’ve been to Huntsville and had a wonderful time, lots to do there and the weather is magnificent most of the year! Thanks for the list.. saw a couple we haven’t tried. You didn’t mention that the First Baptist Church tower is also a bell tower that they play with organ petals Sundays before and after worship. Just wanted to let you know that there aren’t gondolas at Bridge Street anymore. They have drained the man-made pond and I think are turning it into a parking lot. Ughh…I even looked that up to make sure! They even drained the lake? Bummer. Thanks for letting me know. I was just gonna tell you about the lake! B told me. I haven’t been there in nearly a year (except to B&N, of course)! Looks like there is always plenty of parking in front of the Old Navy section and under ground when I go during the week. It may be more crowded on the weekends. I have only gone there once on a weekend and that was with you, LA, and Lana, I believe!